I had a record album in college by the folk-rock artist Donovan that got played a lot. One of my favorite cuts was 'Atlantis'. It was a spoken narrative about the Lost Continent accompanied by a musical background and I think I've been fascinated by the concept of that sunken watery civilzation ever since. Across a short strait of sea miles." In all legends from all lands were from fair Atlantis." "Knowing her fate, Atlantis sent out ships to all corners of the Earth. Let us rejoice and let us sing and dance and ring in the new . . .
"Way down below the ocean, where I wanna be, she may be . . .
Way down below the ocean, where I wanna be, she may be . . ."
This is the time of year when all the clothing catalogs drag out their latest swimwear, probably catering to those who are lucky enough to fly to warmer climes and forget that Mud Season is about to arrive, melting the snow and coloring everything in boring hues of brown and dead foliage. So many artists are thinking beachy colors. I'm rather more a beachcomber than a beach-sitter. I love to explore the tidepools hidden in rocky shores and discover the strange, exotic life living there. I am also enamored of National Geographic specials featuring maritime archaeologists who dig up old ships and their long-lost cargoes. Our very own Lake Champlain is full of 17th and 18th century finds that have been preserved in the deep and icy waters of the lake. 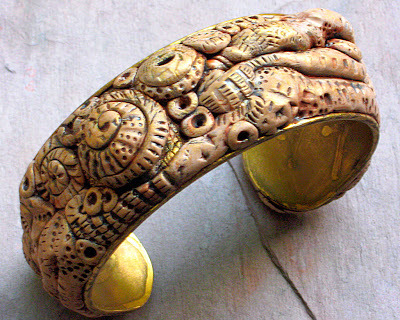 So my artistic mind wandered to a space of “Atlantis meets archaeology” while I was experimenting with a cuff design. I had been playing with a new texture tool from my favorite store, the hardware variety – a threaded bolt. When you roll this over raw polymer clay it leaves parallel lines with depth. You can turn it 90 degrees and roll back across and get a checkered effect. But if you roll up the textured clay after one pass and into a spiral, voila! a faux ammonite appears. 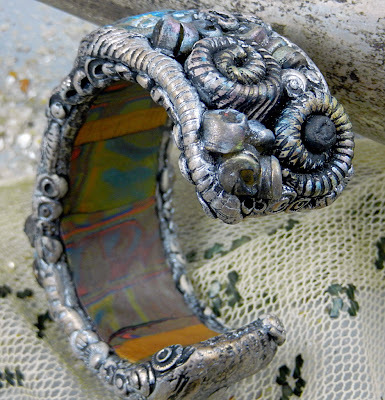 So armed with my ammonites and some little textured pieces I had previously done in black clay and cured, I proceeded to cover a brass cuff from my stash that I had put a basic clay layer on but abandoned. My new idea was to line the inside of the cuff with a colored clay veneer and apply multiple organic elements to the top that would be painted to coordinate with it. I was going for an encrusted, elaborate piece that might have been excavated by Jacques Cousteau and the crew of the Calypso. I was having fun attaching all the bits and pieces and then realized that I really didn't want to have the brass metal of the cuff showing, since my palette was all in silvers and blues. Yikes-- this was going to be a lot more work than I had planned for. But I was committed so I just kept at it. I had done a previous cuff with a tidepool theme and I dug out my favorite tools for the new cuff. 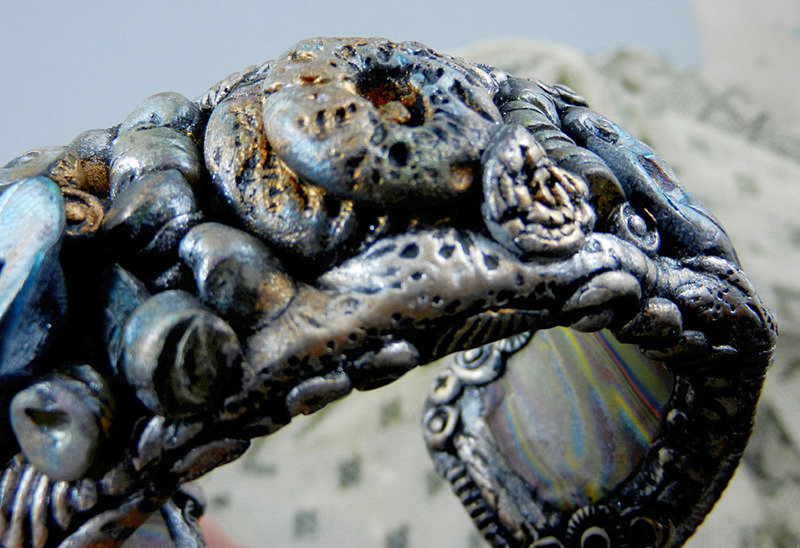 Layers of paint later-- Stewart Gill 'Byzantia', other metallic acrylics--silver gilders wax, faux ammonites, translucent clay pieces antiqued and patinated, the cuff was finished. It's kind of over-the-top and heavy but it really reminds me of something ancient and highly embellished with the kind of patina only time can achieve. 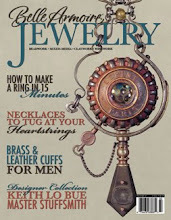 It's really a small sculpture and every piece I do, whether or not I wear it, teaches me something. And having looked up the lyrics of Donovan's song, I remember how much I liked them and the ideas they evoked. Some stuff holds its value, even 40 years later. 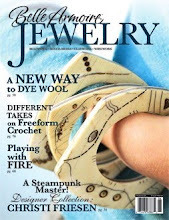 I'll be teaching a class on polymer clay-embellished cuff blanks this year at ArtBliss in September in the DC area. 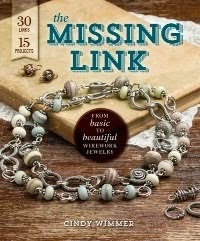 Stay tuned to this blog for more information on classes. 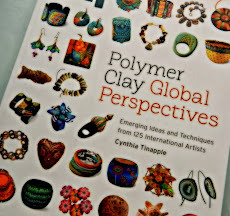 It's a great event with some fabulous teachers and although we won't be doing anything nearly this elaborate, we will be having fun with color and texture and learning lots about using polymer clay. 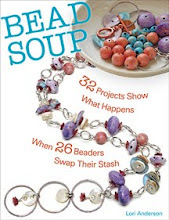 Once again we plunge into the creative soup of the Bead Soup Blog Party, brainchild of Lori Anderson, hostess extraordinaire, who patiently matches and then husbands the pairs of participants -- a full 100 this time! from receipt of their beads to the final grand finale of the Big Reveal. 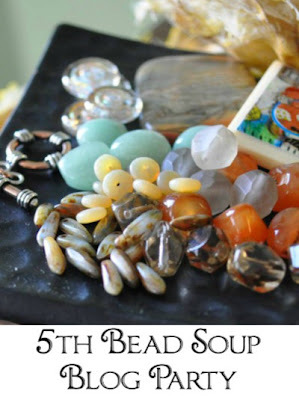 In case you're not familiar with the BSBP, partners are matched and trade sets of beads, to include a focal, a nice clasp and some extra beads that coordinate. 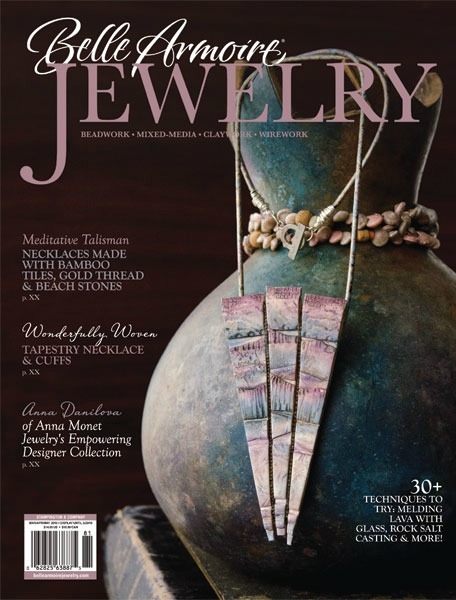 The goal is to make a piece out of those components and hopefully, get outside your comfort zone by working with someone else's colors, style and bead choices. This is my third Bead Soup Party and since I work in polymer clay for the most part, I can usually work easily with whatever I'm given. But the brilliance of the BSBP is that you can just throw your preconceptions out the window because you never know what will be in the little package that you receive from your partner. I was partnered this time with Deb Brooks of From the Heart Creations who handcrafted the focal she sent me out of vintage mother-of-pearl buttons. Did I mention that I have a teensy obsession with MOP? Well, you don't want to see my eBay invoices. I have quite the collection. 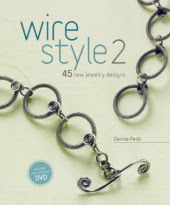 Deb made a button stack of several of her beauties and wrapped them in brass wire with a sinuous Deco feel to both the focal and the clasp. I also love old jet buttons and Deb included one of them in the focal as well. I wanted to pick up the subtle colors of the MOP in both the white buttons and the darker purple one so I chose ochre yellow, salmon pink and purple as a working palette. Black was my neutral and I tried to incorporate as many of the faceted black beads into my stringing that Deb included in the coordinating 'soup'. There were lovely salmon tracings in the long agate beads she sent so I decided to combine both copper and bronze metals in the piece. I usually work with rather large elements in my designs and always incorporate polymer into them so my first issue was how to use polymer as well as enlarge the focal area of my piece. Making a molded copy of one of my vintage beads allowed me to emphasize my color palette by hand-coloring the polymer element and enlarge my design area. Then I decided to take a page from the book of the talented Cynthia Deis, owner of Ornamentea--who was my partner on the last BSBP-- and add a lush tassel to the bottom of the MOP focal. 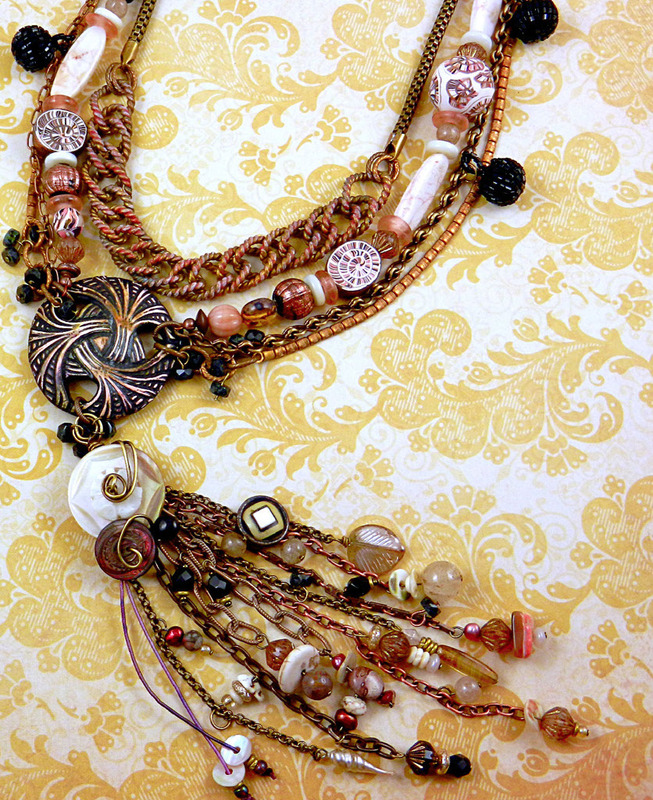 It gave me a chance to play with lots of tiny rare elements that I tend to collect, mixing and blending favorite components together-- vintage buttons, quartz beads, pre-war Japanese celluloid leaves, Czech glass, pearls and hand-dyed rayon cord. 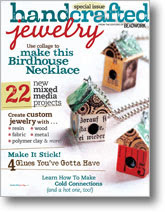 To round out the necklace strands, I dug into my stash of old polymer beads and found some from a tutorial on making polymer clay ammonite beads by Heather Powers. Both the design and color of these were perfect for my purpose. I added some gilders paste to the edges in black and copper and then just because I love them, I added some vintage Japanese black beaded ball beads to the chains for bling. I've tweaked this a bit since the original Reveal day, since I had some other elements that I had thought about adding. I like to make a piece and then consider it for days or even weeks, until inspiration strikes. I sometimes like to add an extra freestanding chain and so I connected a vintage twisted link bracelet length to a box chain and colored the links some with gilders wax to make the colors blend better with the other elements. Another vintage chain and some Czech glass rondelles were added as well. Now it has the color and flow and a balance I wanted. This project definitely pushed me in directions I hadn't taken before. Just like a good Bead Soup selection should! Thanks, Deb! Thanks, Lori! Thanks everyone for playing along. Enjoy the Hop! You can follow the action by going to Lori's site at http://www.prettythingsblog.com/ for a full list of participants.